Many aquarists feed their piranhas on smaller fish, but this is not recommended, as it results in a high fat intake which can lead to obesity. Young piranhas will happily accept flakes and freeze dried foods like tubifex and bloodworm, but older ones prefer a meatier diet. Pieces of lean beef, chicken and fish are popular choices. However, to remain in good health, your piranhas will also need vegetable matter in their diets. Pieces of raw potato, banana and courgette are usually well received. Breeding piranhas in captivity is notoriously difficult, since many will tear each other apart on sight, but if you do manage to find a compatible pair you'll discover that they need very little help. Supply them with loose stones, plants and bits of driftwood and they'll build a nest in which to lay their eggs, which take two to three days to hatch. The male will be primarily responsible for guarding the fry, and he'll be even more aggressive than usual when doing so, so be careful around him. The fry can be fed on small live brine shrimp. @jonesy - you'd want a minimum tank size of 25 litres and larger if you are thinking of having a couple or a few fish. 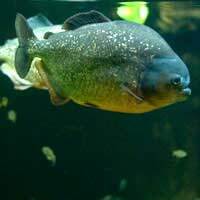 Is it ok to keep a single piranha if so what is the minimum size of tank. I have kept tropical fish in the past but never Piranha. I did not know there was a piranha club I might join.